This the new year and yes still on subject for the most part. The subject being: Life without Windows or OS X, the 2 big dogs on the planet. While Windows is the dominant desktop computing platform, it isn't the only game in town. Millions of people live every day without Windows XP or Vista all the time. I use Windows on my terms, if and when I choose to. I use open Suse, Linspire, and PClinuxOS for almost everything I have ever done in Windows. When I say "almost everything," I mean that Linux at this time does not have the support of many ISV's as Windows XP. That is changing....slowly, but that is changing. You know there was a time when a time Microsoft was able to charge PC companies a Windows licence fee for every PC they shipped, whether or not the PCs actually shipped with Windows preinstalled. Cool deal while it lasted, but regulatory concerns have subsequently eroded Microsoft's ability to collect a Windows licence fee on, say, a PC that ships with Linux preinstalled. And last year Microsoft's CEO Steve Ballmer’s declaration that Linux “uses our intellectual property” , a horse thought long dead by many. Novell objected to Ballmer’s characterization of its patent deal with Microsoft and some users accusing him of trying to sow fears about using Linux. Then Microsoft later released a statement saying it “respects Novell’s point of view on the patent issue, even while we respectfully take a different view.” Microsoft acknowledged that Novell is “absolutely right” in saying it didn’t admit to any Linux patent problems as part of their agreement. They have 95% of the desktop market in the US, it seems they want the other 5%. They over there know what we all know. No matter what; people have no intention of trying something new no matter how many articles they read about someone going to Linux because they have had it with XP. For every one person who has made the switch to Linux, there are thousands who are buying their first computer with Windows on it. So what is this fight for 5% about? Truth be told, My parents have got an ancient system at home that runs KDE and open SUSE well enough, see that's the great thing about Linux, it's light enough to run on just about anything. They try not to leave an old system behind. But if you are a hardware manufacturer, that is news you don't want to hear. Windows Vista will help PC vendors sell more desktops than Linux will. Bought a system new in 2003, just got it paid for a week ago. Well its time to go in deat again for a Vista PC able PC. Linux on the desktop needs strong support from groups outside the Linux community and its just not really there yet. Microsoft has nothing to worry about. They just want 100% of every thing. In guess every one does, but i like every one else was taught to share at a young age. Klik allows you to run applications from a single file (Like OSX application dirs), but its for linux. The is not a package management system. It doesn't strive to replace apt-get, dpkg, rpm, yum, apt4rpm, portage, smart, autopackage, or CNR. 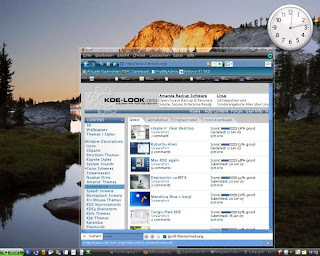 Linspire released a new open-source CNR client in December for other popular desktop Linux distributions called CNR.com. Users of CNR.com, will be able to safely and legally add support to their Linux desktop for things such as mp3, Windows Media, Quick Time, Java, Flash, ATI drivers, nVidia drivers, and so on. Both Debian and RPM distributions will be supported. During 2007, CNR.com will be rolling out support for current versions of the following distributions: Debian, Fedora Core, Linspire/Freespire, OpenSUSE last but not least Ubuntu. There are those in the Linux world that would want Will Gates to just go away. I am not one. Locking someone into open source is just as bad as locking someone into proprietary software. instant messaging (IM) client for Linux.